DD5LP/P – March 10th. 2018 DL/AM-176 Rentschen (for VK-EU S2S event). SFI of 67 (The formulae given in the June 1996 edition of the IPS Solar Geophysical Summary states 67.0 as the minimum possible value.). K index of 4 means REALLY noisy. 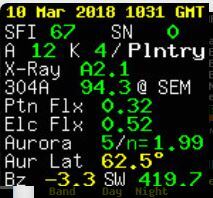 As well as the propagation conditions being expected (and proved) to be bad, the expected 15 degrees and sunshine was moved back by a day by the forecasters (and then never came). These factors along with the fact that I took a pretty hefty tumble on the ice in -15 degrees temperatures a week before the event meant that if I was going to take part at all, I would have to go to a more local summit. All of the 6 point and above summits are accessed via a chair lift or cable car and none of those start service until 9 am local. In fact several are not even running again until the “summer season” which starts at Easter. My next choice was Eisenberg while only a 2 pointer it is relatively close but requires a good 10 minute steep walk. Two days before the event I was in a great deal of pain from my back injury so I decided even that summit might be too much and switched my activation to Rentschen, which is a literal “drive on summit”. Unfortunately as I have already activated this summit this year, I would get no points for it, but at least I would be taking part in the event. Equipment: I wanted to use the Xiegu X108G for this activation and as I had repaired the linked dipole after the problems at Attenberg a few weeks earlier, that would be my 40m antenna. I had also bought but not yet used 3 commercially made J-pole antennas from Lambdahalbe. One for 20m, one for 17m and one for 15m. All of this new or repaired equipment was to be tested out on the Wednesday or Thursday in the week prior to the S2S event with an activation of Ammerleite – again a close summit, only 1 point but up until the end of March it earns another 3 winter bonus points and I hadn’t yet activated it in 2018. Well that activation never took place as I was suffering with my back and there’s no way I could have managed the climb up to Ammerleite. Friday allowed a quick test in a local field and I was all prepared with a WSPR beacon program installed on my smart phone, so that I could connect up the antennas in turn, send a transmission and then check later via wspr.net how they performed. We decided to combine this short 30 minute test session with taking the dog for a walk and my wife agreed to come along and take the dog for her walk in the fields while I “did my radio stuff”. Long story short, the tests did not get completed as the 10 metre DX-Wire fibreglass support mast caused me several problems. Compared to my shorter (and much lighter and cheaper) 6 metre mast, the DX-wire “Mini-mast” bends far too much even before it is at full height. I have had problems before with this mast collapsing into itself without warning – this time the opposite occurred. When it was obvious I was not going to be able to complete my tests, I wanted to lower the mast but then sections jammed meaning I had to man-handle it down and bring it home in sections not collapsed in the car and totally disassemble and rebuild the mast (again) once I got it home. One thing was for certain – that DX-wire 10m mini-mast was not going on my Saturday activation! It was replaced with one of my two Lambdahalbe 6 metre masts, which would impact the use of the J-pole antennas due to their length. Rentschen is a drive-on plateau just outside Wildsteig according to Google, 47 minutes drive away from my home. I managed it this time in just under 40 minutes but the return journey took over 50 minutes. The difference a bit of traffic makes. In any case one of my closest summits. I have activated here many times before, so I knew the layout and for that reason packed the screw-in sun umbrella base to support the mast as there is no convenient fence post or small tree around (see photos below). The run down was uneventful and with relatively clear roads, I was able to get a good run down leaving home at 6:15 am local time. The weather was cool but not cold and it wasn’t raining – the ground was wet from overnight but not muddy, so compared to the last couple of weeks a very good situation. As well as not being any available support for the mast, there’s also no seating, so the plastic painters sheet was put down and my two bags sat on top of it until I sorted out the mast and antennas. My idea was that I would put the SOTABeams Band-hopper linked dipole up as usual for 40 & 20 metres and then from a carabiner under the dipole feed-point hang the end of the J-pole. Initially I put up the 17m J-pole but later tried the 15m one as well. I initially set the links on the dipole to be 20 metres as I could already see some spots for that band. Once the antennas were up in a relatively stable condition (leaning a little but not as bad as I have had), I turned to unpacking and laying out the station. With the new rig (the XIEGU X-108G) I do not have the convenience of an internal LIPO battery as I have on my FT-817ND, so I have constructed a battery box that holds a hardcase 5AH 4S (16.5v) LIPO and an electronic regulator that reduces the voltage to a constant 13.8v for the rig. What I found on this activation was that if I close the (see through) boxes lid, it can press on one of the regulators buttons, which turns the power off! Not ideal. After I realised that, I left the lid open but the unit did switch off a couple of times later without warning – more investigation needed – I did say this configuration was not tested didn’t I? On turning on the rig on 20 metres there was immediately a high noise level (around S7) – this did not bode well but when I tunes the band there were spots where it was not as bad and the noise also seemed to move around the band. My first thought was that the voltage regulator was causing this problem however I did not have this problem the last time I used this configuration, so either something is failing in the (new) regulator or the problem was external – possibly something to do with the overhead high voltage lines or some new equipment in the nearby buildings. In any case there was nothing I could do on the summit apart from try to hear stations through the noise. As I would find out after the event from other people’s reports 20m was dead and very noisy at this time and I had arrived just as the band had closed to VK/ZL – the thought is that the last hop into Europe was actually Sporadic-E which would explain the hour earlier time than had been the case earlier in the week and the sudden band turning-off rather than fading. Luckily from 0730 UTC I had a run of contacts on 40 metres including one S2S. Once that run finished, I decided to check 20m again and found Herbert OE9HRV/P booming in talking to another summit so I waited until he had finished and then called him for my 2nd. S2S. Another fruitless 10 minutes spotting and calling on 20m and I decided to call it a day! Three Lambdahalbe single band J-pole antennas for 20, 17 and 15 metres. Battery box with hardcase 5AH 4S LIPO battery and electronic regulator. After tests at home, I am happy to report the interference did not come from the voltage regulator so it must be something on the summit creating that horrible noise. That added to atmospheric noise being so high and there was inevitably going to be problems. The regulator did not turn off at home, so I can only think that something managed to press on one of the buttons during the activation. I have now found how to lock the buttons to avoid this happenein. The Xiegu appears to have worked correctly on this activation, so I can rely on the rig in the future. The antenna situation needs work. I have looked around and there does not appear to be any good quality 10 metre mini-poles on the market. The only one is the DX-Wire one where the fibreglass sections simply have walls that are too thin to be reliable. My options are therefore to either buy one that is longer to carry (and hence has less sections, each of which with thicker walls) or find an alternative way to support the J-Pole antennas – perhaps I can install them in an Inverted-L format? This entry was posted in SOTA and tagged DL/AM-176, Rentschen, SOTA by VK2JI DD5LP G8GLM. Bookmark the permalink.